Blazer ES1000CR Micro Torch – Is It Worth Your Money? Home/Tools/Blazer ES1000CR Micro Torch – Is It Worth Your Money? Do you need a micro torch in your garage? A small handheld torch can be very handy when you are planning to shirk wrap electrical wiring especially on your car. A small torch can also be used to remove a stuck nut. Sometimes a nut on your car can be secured too tightly it is almost impossible to remove. You can use brute force to remove the nut but that may lead to damaging the nut or your tool. A trick most car mechanic use is to heat up the nut first before turning the nut with a wrench. The heat from the torch will expand the body of the nut therefore loosening its thread. If you are looking for a small handheld torch for your garage, which one should you choose? Why not consider the Blazer ES1000CR Spitfire Butane Refillable torch. What’s so special about the Blazer ES1000CR torch? The handheld torch from Blazer is relatively small in size and can be easily stored in a tool box. Due to its tiny size, it weighs a mere 5.4 ounces. It comes with a child resistant lock to ensure your kids will not be able to ignite the torch flame. The flame from the ES1000CR is wind resistance and can burn for approximately 30 minutes continuously. The temperature of the flame can reach as high as 2500 degrees. The Blazer ES1000CR features a very unique angle head design with a lever to allow precise control of the flame. By using the level, you can control the type, length and also the length of the flame with one 1 hand. The ES1000CR can burn a standard yellow flame or you can kick it up into the powerful blue flame. The Blazer ES1000CR is an ideal tool for car repair, electrical wiring maintenance, heat sink tubing work etc. 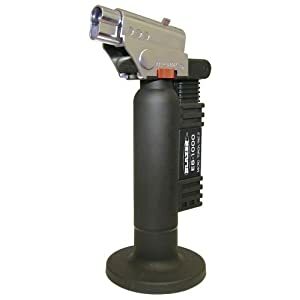 If you are looking to get the Blazer ES1000CR Spitfire Butane Refillable torch, it is available from Amazon.com for only $44.60. Click on the link on the right to buy it now!